What can Kate Winslet teach you about proof-reading Business Proposals? Watch the movie The Reader and it will make sense. If she was writing this blog, she’d probably say: “Don’t do it all at once! One of the biggest mistakes you can make when revising any business proposal, is to do it all in one go. You can’t!” And she’d be right. Make it easy on yourself and focus on one area at a time. Instead of revising the document in one session, break out the tasks and revise the document by task. For example, start with checking the facts, then the spelling, how the document flows, cross-references, footers, index entries and so on. 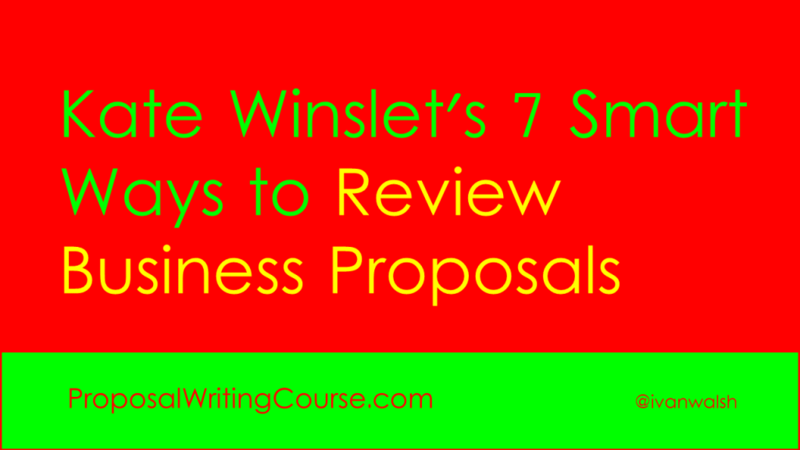 Seven Ways to Read Business Proposals. Overview – In the opening section, do you have a statement, a sentence or two that states the main point or argument of your document? Likewise, is there a conclusion that ties together all the points made in your document? Tasks – Does your user guide address the user’s requirements? Check the document to see if you addressed each task and provided enough information for the user to perform the task. Structure – Does the document flow? Make sure each topic connects clearly and logically. Do the topic sentences of each paragraph relate to the subject matter? Accuracy – Is the information correct? Is it adequately documented? Have you tested the document so that it helps the reader to perform their tasks? Drafts – Technical Writing involves writing multiple drafts. This means that after each draft, you need to check that the edits have been included in the correct draft. Read Aloud – Get into the habit of reading your documents aloud. If you have trouble reading a sentence clearly and smoothly, it probably needs to be rewritten. And if it sounds wrong to your ear, then that’s a warning sign that something needs to be corrected. PS – I also use a checklist to check off the different tasks as I revise technical document. This is especially helpful if you’re working late or are revising several documents in succession. One mistake to avoid is to focus on one area, for example spelling, and overlook other areas, for example, the accuracy of the material. While the reader may forgive you for the occasional spelling mistake, they won’t be impressed if the material itself is incorrect. How do you revise your documents? What mistakes do you see most often?